Roomba Forecaster is a user-script that shows the question's status with respect to being deleted by Roomba. You can click on the "roomba" status line to open an options dialog to change display settings. Alternately, the table can be always visible by selecting the appropriate display option. 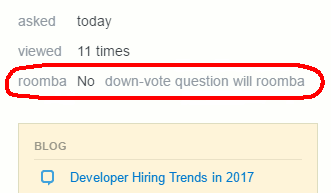 In addition, the default is to display if you down-voting on the question and/or answer(s) will qualify the question to be Roomba'ed. 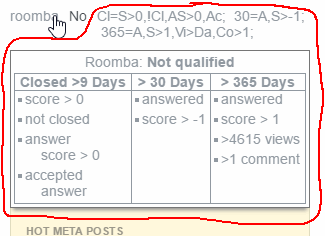 If the question will be deleted by Roomba, then the number of days until it is deleted is displayed, along with if it is a daily, or weekly Roomba task. Clicking on the Close button will keep the selected options for use on this page only. Save will store the options for use on all pages. Cancel abandons any changes you have made to the options. The best way to learn what they mean is to match them up against what is displayed in the larger table (either as a tooltip, or always displayed). It's a userscript. Use a userscript manager. This is a userscript, so you will want/need Tampermonkey (closed source, most widely available), Violentmonkey (open source), or other userscript manager. Unfortunately, I can no longer recommend Greasemonkey (open source; Firefox only). I try to make sure that my scripts are compatible with Greasemonkey 4.X (GM4), but it lacks features which some of my scripts use, but, for my scripts, I try to make it that their lack just degrades performance. The change to Greasemonkey 4.X was required by Firefox moving to only WebExtensions based add-ons. However, there were significant changes made to Greasemonkey which broke backward compatibility (and there's still a significant lack of functionality). There is no intent to fix backward compatibility. As a result, using Greasemonkey 4.X will result in ongoing issues with older scripts which have not been updated to be used with it. Thus, while I used to strongly recommend Greasemonkey 3.X due to a significantly better security environment (gone in GM4), I recommend against using Greasemonkey 4.X vs. the alternatives. Please file any bugs/feature requests as issues there. You can contact me through Stack Exchange comments or chat. If there are problems with, or feature requests for, this userscript, please file an issue on GitHub. While GitHub issues are preferred for bugs/feature requests, making sure I get the information (e.g. comments/chat) is sufficient. Roomba Forecaster has been tested on Chrome, Firefox, Firefox ESR, Firefox for Android, Opera, and Edge. It should also be compatible with other browsers. The tooltip is styled to look like a native tooltip in the browsers which were tested: Chrome, Firefox, Firefox ESR, Firefox for Android, Opera, and Edge. Thus, the tooltip will look slightly different in in each browser. The images above are from Chrome. Roomba Forecaster's code is released under the MIT License. Earlier versions of Roomba Forecaster's code were released under CC BY-SA 4.0, the international version of the license used for all contributions to Stack Exchange. This is a fork of RoombaForecast. 1. Actually, four Roomba tasks run weekly. The other two affect only questions which have been migrated to another Stack Exchange site (leaving a migration stub) or migrated from another site and rejected. While the script does detect these, the Stack Exchange system automatically redirects the page to the site where the question currently exists. Thus, unless something changes in how Stack Exchange displays such questions, you add the ?noredirect=1 parameter to the URL, or are a moderator on the site where the migration stub exists, it's unlikely you will see one. OTOH, you could, of course, go searching for rejected migrations which have not yet been deleted. Note that there are some old, migrated questions that have been closed on the destination site, which should have triggered their rejection. While these fit the documented criteria for Roomba deletion, they do not get deleted. 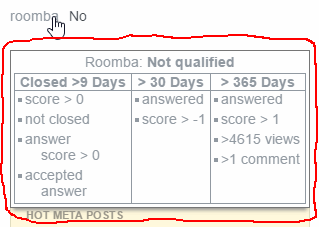 If the question has not been deleted after twice being eligible for deletion when Roomba ran, then Roomba Forecaster assumes that the question is not actually eligible to be Roomba'd. If the documentation is updated to indicate the actual criteria, then the script will be updated. Browse other questions tagged script greasemonkey tampermonkey roomba .